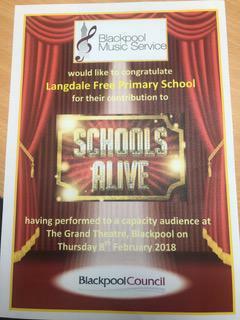 A big well done to all that took part in this years Schools Alive event at the Blackpool Winter Gardens. Our very own rendition of 'High School Musical' was outstanding, and we are so proud of all the children who took part. A big thank you to Mrs Barber, Miss Stevens for the choir and dance rehearsals. Miss Finlay for costume design and help.